Fiesta’s currently line features a nice range of retro colors. Introduced in 1936, Fiesta dinnerware was casual yet inexpensive tableware in solid colors. One could easily mix and match colors to create a beautiful spectrum on the dinner table. The line was discontinued in 1972, but was revived in 1986. The original line featured just five colors – red (which was actually an orange), blue, green, yellow and ivory. Turquoise was introduced in 1937. Avid collectors seek pieces from the initial line, which featured 30+ different pieces (plates, sugar bowls, etc.). But those wanting to add retro flair to the modern home on a budget can choose from a wide assortment of newly produced settings. I spotted this display at my local Bed Bath & Beyond. Simple and clean, it represents key color lines, and the “fail safe” mix and match method. 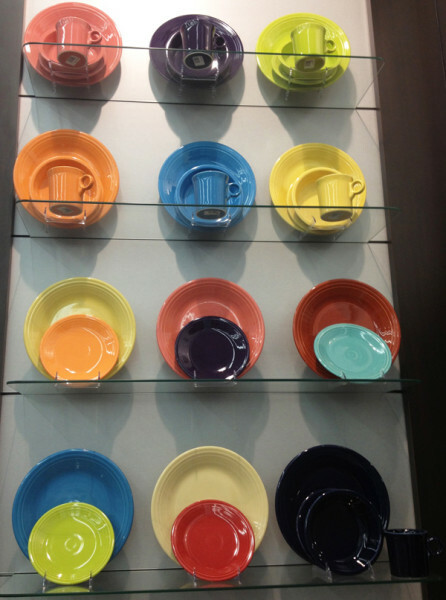 Each year Fiesta introduces a new color (last year it was Flamingo, which you can see in the top left), but maintains the classic design of the dinnerware. That means you can keep adding to an existing set without compromising the overall look. As for a real red? It’s called Scarlet. And it’s so beautiful. Fiesta dinnerware and tableware in Scarlet. The new color for 2013 is called Lapis. It’s a nice, rich blue and should be available soon. Are you a fan of Fiesta? Do you collect vintage pieces, or are the latest offerings enough to whet your retro tastes?